If you're a flippin'/punchin' aficionado, this reel is for you. With 11 bearings, 5.9 oz construction, and a fixed line guide, the Apex Flippin Reel limits fatigue while tossing big rigs, while maintaining a silky-smooth cast and retrieve. The spool also holds only 75 yds of 40 lbs braid, which doesn't seem a lot, but it's all that's used in flipping and pitching, so save that line for your frogging reels! 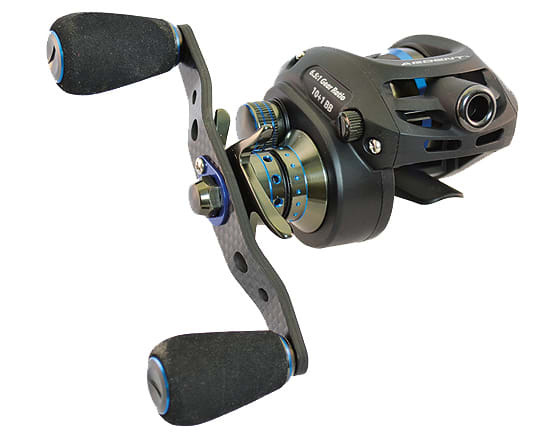 Designed by Denny Brauer, the king of flipping, this reel provides top-of-the-line performance in a specific application. The 6:5:1 will retrieve 26” of line per turn. If you prefer flipping with slower gear ratios, this a perfect speed for you. The 7:3:1 will retrieve 32” of line per turn. This gear ratio is great if you're a fast flipping/pitching angler. It enables you to get baits in front of more fish in a shorter timeline.